Gambit. Remy LeBeau. His fans love him fiercely, but it can be hard to admit loyalty toward him—even fellow X-Men devotees who are supposed to respect individuality, as it is a main theme of the franchise, can be pretty vicious in their criticism of the Ragin’ Cajun. Gambit has been called the lamest mutant, the wussiest mutant. And yet, for all the disdain he’s given, he is still going strong, immune to all those put-downs. Not bad for the wussiest X-Man. There is some justification for this scorn, as the character has not always been handled ideally. The most cringe-worthy rendition for me is his portrayal in the ’90s X-Men animated series, where he would refer to himself in the third person: “Gambit rather be in Monte Carlo.” “You wanna play with Gambit?” “What took you so long, chère? Gambit had to hold this place on his own.” Painful. It took the intellect right out of this intellectual property. In considering what lessons we can learn from Gambit that apply to our own lives, it’s only natural for me to compare him to Batman, the archetypal hero whose inspirational traits I have discussed in previous articles. One thing is for sure, and that is that Gambit and Batman are nothing alike, and the lessons we might learn from each of them are strikingly different. Batman is respected and feared by others because he so mission driven. 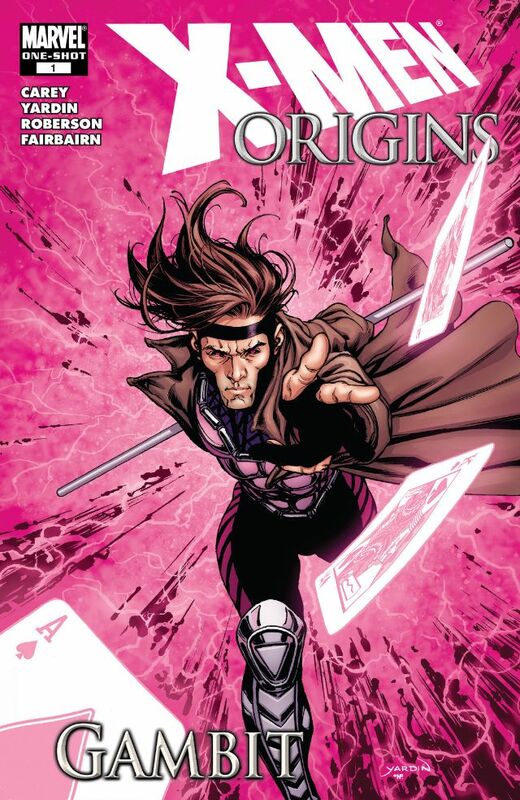 Gambit, on the other hand, is both admired and disliked because he is confident in his individuality. This is what I like about Gambit more than anything: that he is absolutely in love with who he is, and has fun doing what he does. This is obvious right down to his costume choice—he dares to flaunt stylized, skin-tight magenta armor with an oversized overcoat. It really shouldn’t work, but Gambit is so confident in who he is that he makes the ensemble spectacular. Even if you aren’t the biggest fan of his sense of style, the fact that he has a distinct look speaks volumes, and it antagonizes members of the anti-Gambit club. People have enough trouble being comfortable in their own skin, and then they come across this Gambit character, an apparently straight man who is at ease enough to wear pink, a mismatched trench coat, semifingerless gloves, and let us not forget those high-heeled boots! Gambit’s whole look challenges traditional (or stereotypical) masculinity, and it is a powerful weapon. His chosen appearance makes him feel fantastic while also disarming those around him. It is in this area where Gambit is best at employing his other surprise weapon: his magnificent charm. When I started reading Gambit comics, I understood him to simply be a charming person. As far as I’m concerned, it was a huge mistake when that charm was rewritten to be one of his mutant powers—calling Gambit’s charisma a mutant power is like saying that Batman is always employing fear-inducing gas rather than imparting actual fear in his enemies. It makes the character’s non-superpower qualities far less impressive. It is also an injustice against the quality itself of being charming to say it is a superpower, making this ability seem inaccessible when it’s absolutely achievable in the real world. Like most things in life it can take practice and determination, but it isn’t so far out of reach that it should be labeled a superpower. I would also argue that it can make those who are naturally charming seem devious as well, when in fact many acts of evil or violence, from the macro to the micro, are avoided by Gambit-like personalities who can keep their cool and mitigate a tense situation with a smile and some well-chosen words. Like the loud-colored costume and the high-heeled boots, hypnotic charm (or seduction) is a quality that people tend to attribute to women more than men. I believe this is a big reason why some people have trouble accepting him, but it is also why Gambit fits in perfectly with the X-Men as an evolved hero who is protecting a world that fears and hates him, as the saying goes. Through being comfortable with his “feminine” side, especially in the testosterone-unbalanced world of superheroes, Gambit is a nuanced character—and, as a result, he’s a difficult person to write properly and an easy target to hate for those who struggle with their own masculine and feminine balance. Remy LeBeau is a truly unique superhero we can learn a lot from. Even among his fellow X-Men, the most normal thing about him is that he has an explosive mutant power. His costume, his personality, his playing cards—all of it together are a celebration of the many colors of individuality. Even his code name, Gambit, is a lesson on how to live life adventurously. As hockey superstar Wayne Gretzky said, “You miss 100 percent of the shots you don’t take.” So take some more chances in life and have fun doing it. You might not achieve what you want every time, but those chances can really pay off, especially if you take them often enough. Be daring enough to be the rock star you want to be in this world. That is what Gambit teaches us. Gambit cards from the first installment of Upper Deck Legendary: A Marvel Deck Building Game. GREAT article, I love Gambit personally.